A new Heart, Neuro and Vascular Cath Lab at the Riverside University Health System—Medical Center will expand services for heart and neurovascular patients in the region. The fully integrated $4.3 million GE lab includes imaging equipment to visualize the heart and other cerebrovascular structures, and a special system to monitor blood flow throughout the body. 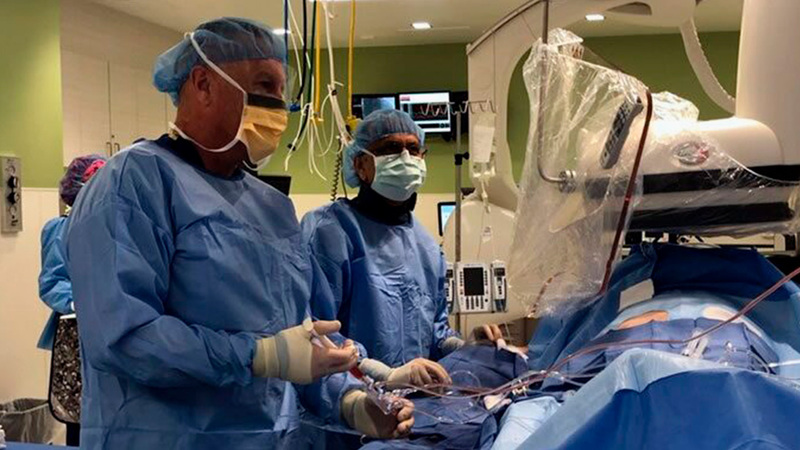 Officials stressed how having a cath lab opens the door for RUHS Medical Center to become a receiving center for patients experiencing one of the deadliest forms of heart attack—an ST-Elevated Myocardial Infarction (STEMI). This condition requires rapid intervention. Ambulances transporting STEMI patients currently by-pass the 439-bed medical center in Moreno Valley in favor of hospitals that are miles away but can currently provide STEMI intervention—with the addition of the new lab, RUHS Medical Center will now be able to assist such patients. In 2015 the Riverside County Board of Supervisors approved $4.3 million to help fund the cath lab as part of a larger spending package that included a da Vinci surgical robot, and new CT and MRI scanners to replace broken-down, obsolete diagnostic machines. Residential home builder KB Home Inland Empire division contributed $1.1 million to the projects with funding raised by the annual KB Home Golf Classic, heading into its thirteenth year this spring. The tournament benefits RUHS Foundation, which raises support for lifesaving programs and equipment at RUHS Medical Center.